Hmmm. ‘Course there’s no way I’d know what strategies and techniques you’re using (and tried) – what’s worked and what hasn’t. But when it comes to what to do about depression, have you considered depression and diet? Could well be that tidbit of wisdom you’re looking for. According to an article published on medscape.com last week, a study published in the March issue of Public Health Nutrition suggests overindulging in junk-food may well spike the risk for depression. And it was a good-sized study at that, some 9,000 adults in Spain participating. Bottom-line? Those who consistently chowed-down on fast-food (burgers, pizza, etc.) – even in small quantities – were 40% more likely to develop depression than those who abstained. And by the way, none of the participants had a history of a diagnosis of depression or antidepressant use. But there’s more. Participants who frequently indulged in commercial baked goods (croissants, doughnuts, muffins, etc.) were in the same boat. Ah, yet more! 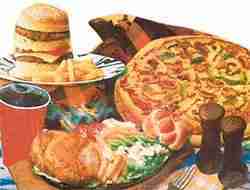 The risk for depression rose as the ingestion of fast-food and commercial baked goods increased. Wondering if you have anything in common with the “indulgers?” Well, let’s see. The study participants with the highest consumption of fast food and commercial baked goods were more likely to be single, less active, smoke, work more than 45 hours per week – and eat less fruits, vegetables, nuts, fish, and/or olive oil. We were not surprised with the results. Several studies have analyzed the association between fast food and commercial bakery consumption and physical diseases, such as obesity or coronary heart disease. With these results, a relatively new line of research is open. Limiting trans fatty acids content in several foods, avoiding the consumption of fast food and bakery, and increasing the consumption of other products such as vegetables, legumes, and fruits should be a primary goal for clinicians and public health makers. It’s significant that Dr. Sánchez-Villegas and colleagues aren’t strangers to the subject matter. Seems they published a study last year in the open access resource PLoS ONE that linked consumption of trans unsaturated fatty acids (TFAs) to a significantly increased risk for depression. …this study adds to the rapidly growing and highly consistent body of literature suggesting that depression is another common, noncommunicable illness with a significant lifestyle component. As such, it is prudent for clinicians to assess and address the dietary as well as exercise habits of their patients, in addition to pharmacological and other established treatments. Oh, one final helpful morsel presented by the research team. They readily acknowledge little is known about the role of diet in the development of depressive disorders. But they point-out that past studies have suggested olive oil, B vitamins, and omega-3 fatty acids may play a preventive role. Relevant and meaningful info all the way around, don’t you think? Hey, no doubt about it – if confronting and defeating depression is Job1 on your side of the fence, you absolutely need to have your prevention bases covered. And a great place to start is with an objective review of your diet, and effecting indicated change. Are you pounding junk-foods? Sure seems as though you aren’t doing yourself any mood-favors (just a small “tidbit of wisdom”). Having a tough time with carb-cravings? Here’s a chipur article that’ll provide some insight.